This won’t provide an experts view on mapping data as I am not an expert and this seems like a complex area – my previous experience here has been placing some pins on a map for a 2D mobile app! What I can help with though is sharing what I have learned and hopefully helping you with a starting point if like a past me you want to get up and running. I am also not trying to replace or undermine any of the commercial offerings here; instead I used this exploration to aid my own understanding and would reach for those in any commercial setting. By the way, if you make one of these or can recommend a good one for use in HoloLens apps please send a note in the comments and I will be happy to review in another post. 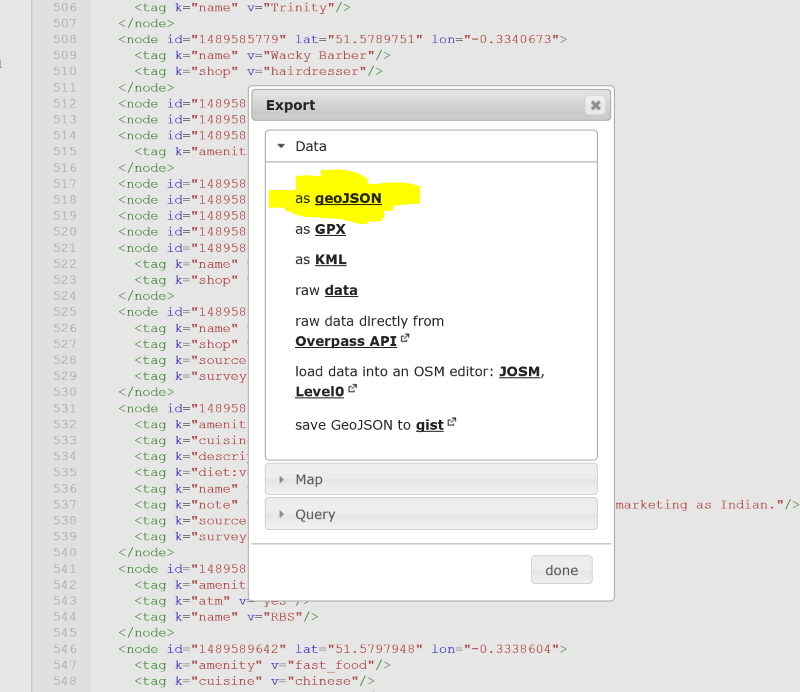 From my initial research I quickly found that there is a JSON internet standard (GeoJSON) used to share geometry data which seemed to be fairly easy to understand and use. I decided to run with that and first build a component in Unity to generate a 3D mesh from GeoJSON; thinking was that I would later be able to find an API or service to retrieve GeoJSON data and plug that in. Since we’ll be using an open standard the hope is that the data source can be switched out for an alternative depending on app requirements. 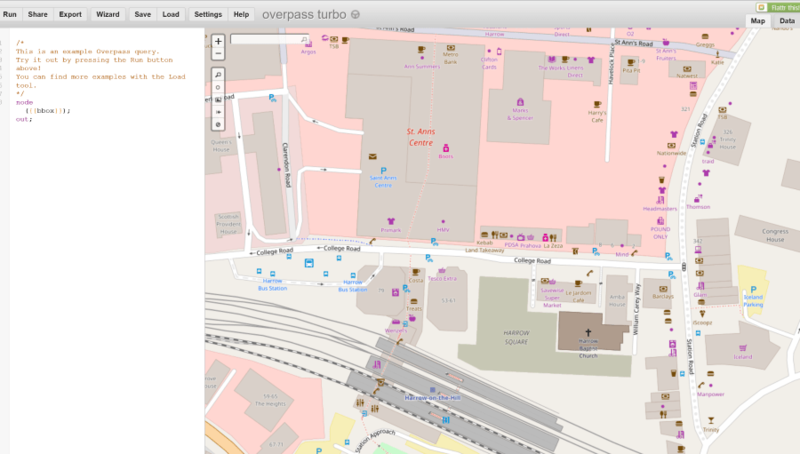 It is possible to use the Open Street Map site here to get data back in the format .osm by specifying a bounding box formed from the latitude and longitude coordinates. 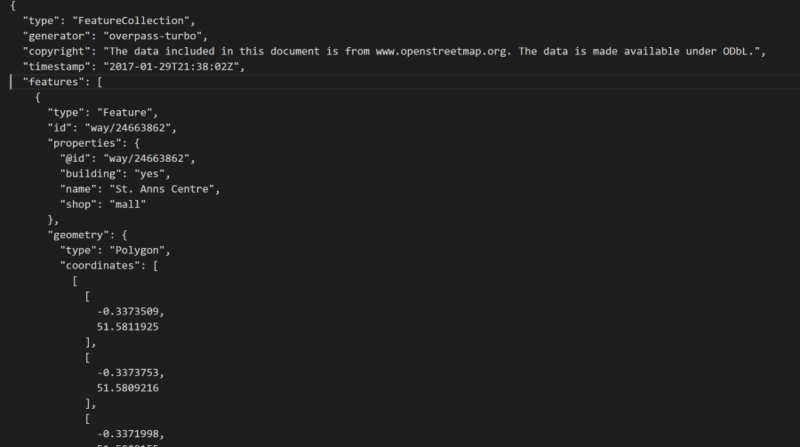 I wanted GeoJSON though and after some further digging I found that you can access OpenStreetMap from the Overpass API which has a tool to facilitate this which uses it’s own query language for requests. I used the tool to get myself some test data which I used to work out how to render the 3D buildings. My initial goal was to create a tool that I could use in the Unity editor to generate the building geometry as opposed to a more dynamic control to let the end user explore a map but I may look into that next. Unity supports custom editors and the approach I took was to create a MonoBehaviour script to be attached to a game object which has an associated custom editor script. These two scripts work together to extend the game object and provide an editor user interface to be able to control how the game object gets extended. First the MonoBehaviour-derived script Then the editor itself (derived from the Editor base class): It’s important to keep in mind that the Editor-derived script is designed to only be run in the Unity editor but the MonoBehaviour is designed to be run in-game and is associated with a Game Object (we don’t want any dependency on the UnityEditor namespace here). I think that this approach makes sense as the plan is to create something that runs in-game ultimately. Given that the input at this stage is a JSON file we need to find a way to get this data into memory, a job I usually reserve for JSON.NET but there seem to be a few challenges getting this to work with Unity (see http://www.what-could-possibly-go-wrong.com/unity-and-nuget/). Instead, I searched around and found fullserializer and decided to give that a try instead. On the whole that decision worked out very well as this seems like a robust and flexible JSON serializer – I did run into this issue though and needed to make some changes to the source code but I was bought in enough to warrant the extra effort. 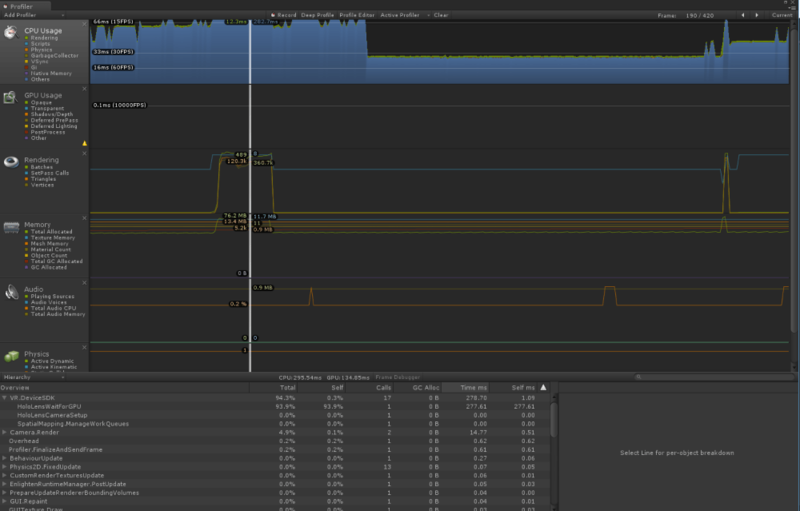 One inconvenience with using a custom editor is that Unity Coroutines don’t run in this environment as they need an update loop to keep running. It is straight-forward to make use of the EditorApplication.update event in order to provide that update loop but it does need the code to be written. Here’s an example of the type of code needed for this. To use you can add an empty GameObject into your scene and then add the ThreeDMapScript as a new component to that GameObject. The custom editor for this component will provide some inputs to allow you to define a bounding box in terms of latitude and longitude. Also, you can specify the height of the levels used for the buildings. This could also be sourced from other data sets so could be a more accurate representation of the building heights. Once set the Generate Map button will cause the script to call the REST API to retrieve the GeoJSON and the satellite image, generate the meshes and apply the required material. Each building is currently represented by a separate mesh as can be seen in the scene hierarchy window and is named from data in the GeoJSON. Once we have the GeoJSON in main memory we need to take the geometry data and convert to a polygonal mesh. The data has a list of ‘features’ in which can be found the buildings each with it’s own geometry defined. A quick scan of the data reveals different types of geometry which is specified as a collection of coordinates given in lat/long. I concentrated my efforts on the ‘polygon’ geometry type and used a polygon triangulator from here to convert the data to a mesh. Running this resulted in 2D polygons which could be extruded to the height of the associated building to give the final form of each building. Notice that some work is done here to ‘create’ the mesh centred on the origin and then use it’s transform to translate it back into position. Also notice that there are steps to generate UV coordinates and apply a material. This is to enable a satellite image to be textured onto the buildings (more on that later). I found some code here http://stackoverflow.com/questions/12896139/geographic-coordinates-converter which I used to enable the conversion from Lat/Long coordinates to metres. I decided to explore using some satellite imagery as a texture for the buildings and ground tile plane. I used the Bing Maps static map API to retrieve an aerial satellite image using the same lat/long bounding box as was used in the request for the geometry data. I proxied these calls via my API also and it might make sense to combine them into one call for a bounding box as they naturally need to be called together. The UV texture coordinate calculations turned out to be a little bit more complicated as in order to work out which sub rectangle of the returned image corresponded to the bounding box it was necessary to make another API call to get the associated metadata and then use that in some simple calculations to work out the offsets correctly. Also, I gave no consideration to the texturing of the vertical walls of the buildings and as a result this doesn’t look too good and I wondered if using something like tri-planar texture mapping would help but ultimately the image data for the side of the buildings is missing from the image. All of the above is non-HoloLens specific but I wanted this to run well on a HoloLens so we need to go a bit further as the HoloLens is essentially a mobile device, with mobile CPU/GPU so we can’t just assume that everything is going to run at 60fps out of the box. In order to track the frame rate at which the device is running we can either use the HoloLens device portal or the FPSDisplay prefab from the HoloToolkit which provides a UI element which stays in your field of view to show the current FPS. I use one of these in the sample in the repo for this project on Github. 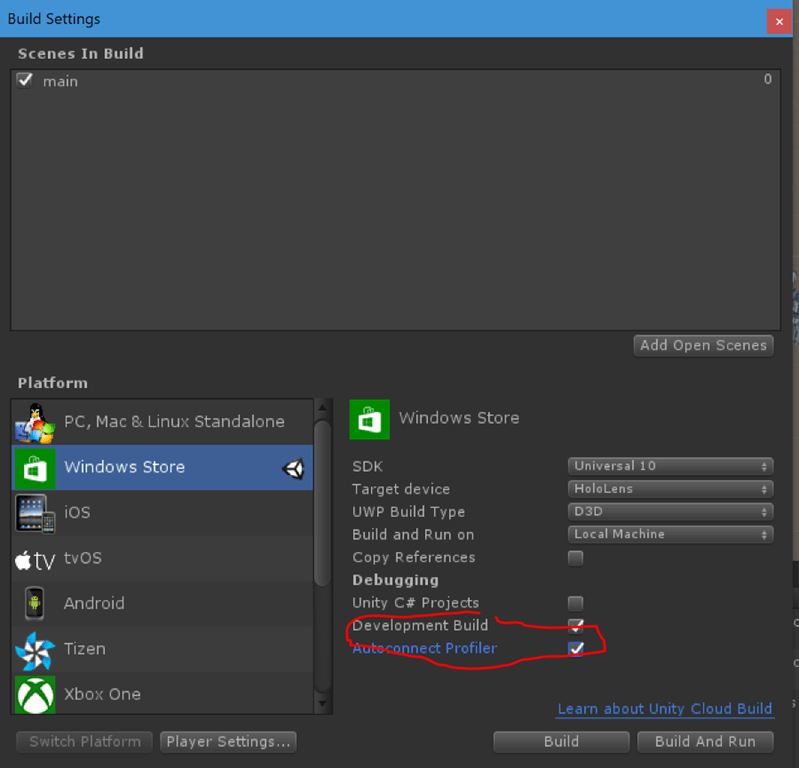 To begin profiling on the HoloLens you need to navigate to the Build Settings in the Unity editor and make sure that the Development Build and Autoconnect Profiler options are both checked. Also, ensure that you have the InternetClient and InternetClientServer options checked in the Player settings. Now if you build and deploy your app to the HoloLens and then open the Unity Profiler window you should get an entry for your device in the active profiler dropdown at the top of the window. As you can see from the video below the app is running at a low frame rate – I haven’t given much thought to optimisation at this stage but in a subsequent post I will take a closer look at the data and try to get the app closer to 60 fps. Looks like when you add ‘using HoloToolkit’ it breaks a few of the fs scripts in the ThreeDMapping\Source\Internal\ folder. You need to include the scripts here https://github.com/peted70/geojsontomesh/tree/master/Samples/HoloLens/HoloLensMapSample/Assets/HoloToolkit/CrossPlatform – I think I must have added them under the HoloToolkit folder by mistake! If the Lytro Ilum could provide video, could you see a path to creating 3D maps viewed by Hololens? could you connect using pdaukin at Microsoft dot com ? Pete this is awesome. I recently got my hands on a Hololens and i’ve been playing around with it quite a bit. Anyways, I am trying to create a new map using your editor and such. When I hit the generate Map button within unity it faults out with “cannot connect to destination host”. I am running the threeDMapDataAPI via command prompt and it just sits idle with “Now listening on: http://localhost:5000. Application Started”. I’m just wondering if you have any suggestions on what I am missing? If you look at this code line here https://github.com/peted70/geojsontomesh/blob/6cce9f7c827e73dd3126f9aa6edf16117ab2948b/EditorProject/Assets/ThreeDMapping/ThreeDMapScript.cs#L72 it looks like the base url with port number is string urlBase = “http://localhost:8165”; so if you are running on port 5000 you need to edit this line (or run on port 8165). This should ideally be a public field and configurable in the editor but I guess I didn’t quite get to that. I would have liked to have extended this to create an example which loaded up tiles of the map as you pan around but unfortunately I ran out of time to work on it. Pete very compliments! I found it very usefull, even if I still didn’t try it. From your Reply: “I would have liked to have extended this to create an example which loaded up tiles of the map as you pan around”. If i would like to do that, I should write a trigger that on “position changes” it should use the API with a different rectangle and then call the method myTarget.Load() of the Editor. Correct? Did you solved the localhost connection problem? I’m running the same with no solution so far. I found very useful as well. However, Couldn’t generate the new map. Seems like there should be a group of developers to work on making it a real working project. What do you think about mapbox? (https://github.com/mapbox) Seems like a very good solution for displaying maps in the AR environment. Also, I updated HoloToolKit and others packages to run your demo. Should I create Pull Request? If any devs are interested I’d be happy to help make it into a real project if there is a need. 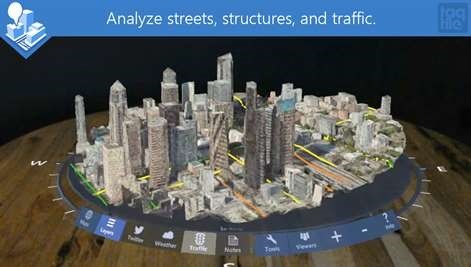 I looked at mapbox some time ago and I don’t think the HoloLens support was quite there but it looks like I need to revisit. Please submit PR and I will update the repo. Many Thanks. P.S I will try to submit PR it sometimes this week.